Since fall season is coming, and we only have sunny and rainy season here in Singapore, let me share with you this fashion blog post inspired with one of my favorite season which truly reflects this look. Aside from black and white colors. the next color the I prefer to wear on a regular basis is the camel tone or earth colored fashion pieces. This color resembles the fall season and it really complements my simple personality yet sophisticated soul. In this look, I'm wearing earth tone rugged shirt from Zalora Singapore and black skinny shorts from ASOS. I'm also wearing my forever comfy gladiator sandals from Zara and complemented it with my black embroidered beret from Sterkowski, an online brand based in Warsaw, Poland. I used some accessories to highlight it like this black and gold studded bracelet from Balenciaga and yellow aviators from Sunnies Studios Philppines. Hope you're having a great last quarter of 2017 and staying fabulous and fashion ready for the next style season to come! More fashion blog post soon to all of you so better continue to check my blog regularly! Have you been to your ultimate country of destination? What was the feeling to set foot on the best place in the world that you can ever imagine in life? Well let me tell you this, I have been to South Korea and Paris France which was truly a dream come true but no other place other than South Africa that truly captivated my travelling soul and became one of the best place in the world that I have ever visited! Welcome the Cape Town, one of the best city to explore in South Africa. This is the ultimate place where I tried both sky diving and shark diving, 2 of the most unforgettable extreme adventures of my life! This is the place where I felt like I was on the other side of the world and who captured the wildest fantasies of my imagination in all of my travel ideas! There's too much photos to choose from but will just share with you some of the best travel photo postcards and I promise to provide more specific blog post for the best food places, must visit sights, excellent hotel accommodations and travel guide in South Africa to give you all the details and tips if you wish to be here one day! Do you love having breakfast! Well you'll surely love this perfect breakfast spot in Manila located at Century City Mall that caters nothing but the finest Pinoy breakfast menus that will surely brighten up your day! Imagine yourself waking up early for the steaming hot cup of coffee and a plate filled with everyone's favourite sunny side up, beef salpicao, marinated fried milkfish or some chicken tocino. Served with hot white rice, you will surely have a full and satisfying breakfast for the day. You must try as well their famous Yin Yang Champorado with toasted crispy dilis on the side perfect when it's cold and raining. And simple say "I Lava YOU!" with their molten Lava Cake to give your beautiful breakfast a sweet ending. Any wild thoughts? Yes it's time for some fashion blog post again and this time I went to the wild jungle side at Singapore Botanic Garden to give justice of this look that I envisioned. I've been into black and white outfits several times for the longest time, being addicted to the minimalist hashtags kind of looks from work wear even to my gym outfits. This look seldom happens so I made sure to get some good detailed shots of it. I'm wearing dark green singlet from ASOS and paired it with Khaki shorts from Zalora Singapore. I love shopping online lately and these 2 fashion pieces were such great finds. I also added some plaid shirt from H&M to add some sporty spice on my look. I'm wearing this yellow aviator shades from Sunnies Studios and cap from Assembly Store Singapore. I paired it with this minimal styled white and green sneakers from a thrift store bought from Thailand. Hope you guys liked this look and always remember there's no rule in fashion, just follow your instinct and express your artistic style well and you'll gonna have the best OOTD to wear. Individuality counts even in fashion so don't hesitate to show your true colors in life. Have a great week ahead guys! One of the most magical island on planet earth where you can spend the best summer of your life will be no other than Bali, Indonesia. To those who have seen it's natural beauty, I bet you will agree that 100% you fell in love on this place too. I came from a tropical island in the Philippines that's also blessed with so much of natural resources, but the Island of Bali is still one of a kind from its picturesque sceneries, golden sunsets and huge waves where the true colors of summer can happen. There's so much to discover in Bali, as I've been here for three time already but still haven't explore some on the best tourist spots and must see places on the island. My last visit here was on April 2017 when my workmates decided to spend a long weekend vacation and had the best summer time of our lives. We explored several locations including Nusa Dua, Pandawa Beach, Uluwatu, Ubud and Seminyak, Every miles we traveled were all worth it looking at the natural beauty of Bali and seeing it's magnificent beaches all over the island. If you're planning to visit Bali, make sure to book your flights between March to May which is the summer season, although the most common issue during this time will be number of tourist visits. Its advisable too in going several places by booking your hotels or AirBnb into various locations to fully explore the island. Don't you worry about the expenses for the transportation and food here coz it's way cheaper than Maldives, Phuket or even in Boracay. One thing that you will also love here will be the local people, with their genuine smile and obvious hospitality that truly captured our hearts, they have the respect and love for tourism and one of their community's source of income and it's been a lifestyle actually to most of them. Let me share with you some of the best tourist spots and locations to visit in Bali, including of course my summer OOTD (haha!) and some of the food haven spots to try in the island. I will never get bored or tired of coming back to Bali and surely you will love to be here too one day! Enjoy this photo diary my dear blog readers! At last, Yellow Cab has finally made its way to Singapore! It's the best pizza and pasta chain for me next to Sbarro and now I don't have to crave for it anymore at it's first location at CityLink Mall will surely be my new face spot right now here at the small red dot. Who can't resist their famous New York's Finest Pizza or their best selling Charlie Chan Pasta? And what about having some chicken hot wings or dear darla signature pizza or even some pistachio ice cream for dessert. With its signature pizza offerings, you will definitely and easily distinguish it's unique flavorful tastes thanks to their generous pizza toppings that really fresh and rich in taste, totally worth every calories you'll digest. Their pasta and chicken also comes with exciting gastronomic flavors that's beyond any description that only you're taste buds can describe. If you're planning for some weekend dinner or maybe meet-up as you're having pizza cravings with friends, try and visit Yellow Cab Pizza and I'm 100% sure you'll not gonna regret it. With the latest trends that's flocking the fashion scene lately, I've noticed the tremendous influence of street brands that are making big names in our fashion world. No doubt that Supreme's collaboration with LV was a big hit and everyone's getting crazy on getting their own piece of this iconic creations. I am also recently inspired by brands like Off-White, BALR and CDG and how they can well complement it to sportswear and street style OOTD. Few weeks back I got a chance to get a photo shoot while strolling around Singapore McRitchie Park. I was supposed to do a sundown run but I ended up asking my friend to do some photo shoot for my Lookbook. I am wearing ORIGINAL statement shirt and striped black shorts from Zalora Singapore. minimalist look up til today but I'm certainly open in exploring more of my fashion style and exposing myself in wearing more sophisticated and trendy outfits in future. Hey guys it's been a while! It's time for some fashion blog post again. I know there are days when you have piles of clothes but you still don't know what to wear! In this blog post, I came up with a very minimal and back to black fashion tricks combining all the basic and comfort fashion pieces in creating a statement. I'm wearing fast and loud statement shirt from Zalora Singapore and black skinny Levis pants. I'm wearing white Converse shoes and camel tone cap from Cotton On and lastly don't forget to wear sunnies like this classic aviator from Rayban. I went to Bali in this look 2 months ago to feel comfortable yet stylish and hope you like it guys! Watch out from more blog post soon. Summer season is almost over and for this travel blog post let me take you back to my first experience of Laboracay. Yes it was way back in 2016 and I have a serious travel back log post for all my beach escapades and way more to share with you guys! It was all about the sun, sea and sand with the rhythm of party beats surrounding the island every 1st of May in one of the world's most iconic summer destination of the world, Boracay Island located in my homeland, the Philippines. It's the best season for you to visit this island where it's equipped with all your party needs and beach experiences you won't forget. Laboracay is known for its reputation of giving you nothing but the best for all party goers and beach lovers. The island offers the best hotel accommodations, party invites, seafood buffet, extreme water rides, by the beach massage and all night free flow drinks if you're really looking up for FUN! So here's a photo diary of my Laboracay experience and hope to experience it again next year! Cheers to life to all my blog followers! Are you a Marvel fan? Well here's the cafe for you to try on here in Singapore. I know this DC Comics inspired cafe has been existing for quite some time already, but since it's my first time and I find it so interesting, I thought of blogging it for everyone to see. It's located at The Shoppes at Marina Bay Sands (Level 01-03) at 2 Bayfront Avenue SG 018972. They are open from 11:30AM til 11PM and up til 11:30PM every Friday & Saturday. Dine in, take-away, save the day - at this immersive cafe - retail experience, home to the DC Comics Universe. For reservations, you call call +65 6688 7610. We went for late lunch here after we visited the Singapore Science Museum. We ordered the My DOG, Krypto! and Holy Guacamole Super Dog ($12.90), The Joker's Loco Nacho ($13.90), Hawkman's Chicken Drumlet ($14.90) and Mr J's Chili Cheese Fries ($13.90). Summer is finally here knocking on our doors asking us for some beach escapades to bask off under the heat of the sun. It's the time of the year where you can go to the most beautiful beaches around the world and simply enjoy the sun sea and sky! So let me share you some of my best summer fashion OOTD that you can use as style inspiration whether you're heading to the white sands of Boracay or to the turquoise blue water of the Maldives Island. Always remember to stay simple and play more on details and also a little bit of mix and match will do the trick. Hope you all guys will have the best summer of 2017! Welcome the honey moon capital of the world - MALDIVES! It was a dream come true when I finally visited this summer's most exclusive beach destination in Asia. I was lucky to stay in one of the most iconic place here in Maldives - no other than Sheraton Maldives Full Moon Resort and Spa. Literally you can live in this island forever as the resort is fully equipped with all your vacation necessities from water sports, wellness spa, buffet restaurants, bar by the beach and the most exclusive resort rooms that feels like heaven on earth. We were lucky to be upgraded into a deluxe family room with private pool access and spacious bed rooms and their bathrooms feels like it only exist in my dream, totally beyond the scope of my imagination. Your 24 hours in a day will surely not be enough as you can do so much in this resort whether you have the active lifestyle or you prefer the chill bum beach life. Although the weather didn't cooperate well with us, that didn't stop us from having the best beach vacation ever. I will post separately on my summer OOTD and more specific travel guide blog post soon. So here's some of my favorite travel post cards from Maldives. Enjoy the summer season guys! We tried the "PICK ME UP" which consist of hazelnut, vanilla, coffee ice cream, toffee nut, espresso, whipped cream & chocolate coin. We also ordered the "TIN ROOF" a best selling mixture of vanilla, chocolate, double chocolate ice cream, roasted peanuts, candied peanuts, toffee nuts, hot fudge sauce, whipped cream and Maraschino cherry. Both price will be for only Php 290.00 pesos. 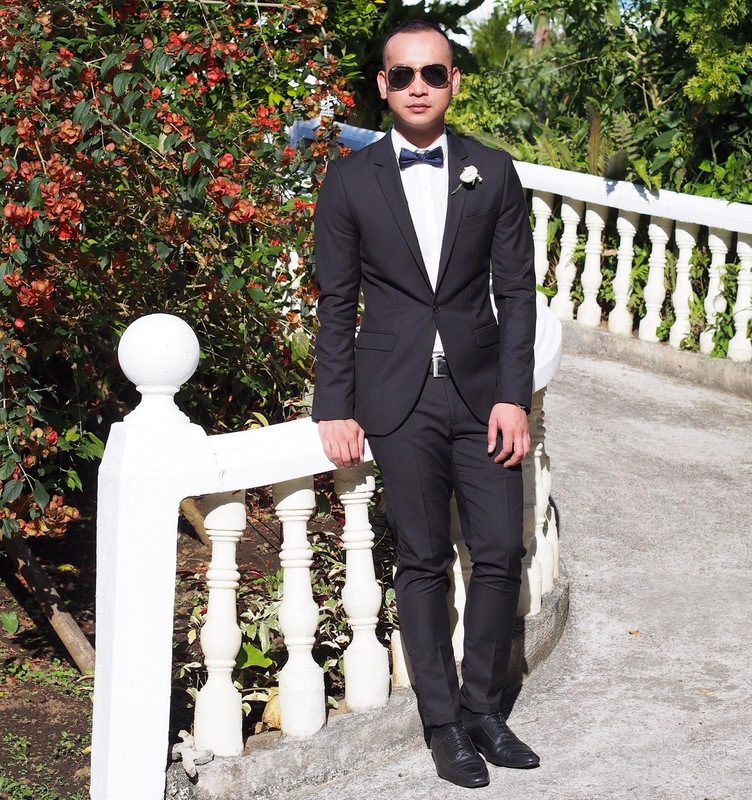 It was my first time to be a best man for my best friend's wedding earlier this month in Tagaytay City Philippines. Finally I got to wear a full suit that capture the essence of a gentleman. I was asked to wear a black suit for the wedding and did some window shopping ahead of time here in Singapore for the best suit that will fit my body structural type. I am wearing a full suit from Topman Singapore and altered the pants to make it the skinny type cut that I want. I am waering an inner white long sleeve from Topman as well. The blue bowtie from Zara was the ice breaker of this look. Since it's an afternoon wedding., I made sure to have my classic aviator from Ray-Ban with me to complete my dapper look. I felt a little awkward as I'm not used to wearing formal attires. But of course you have to own the look and be a little confident in dressing up to get that best look out of you. 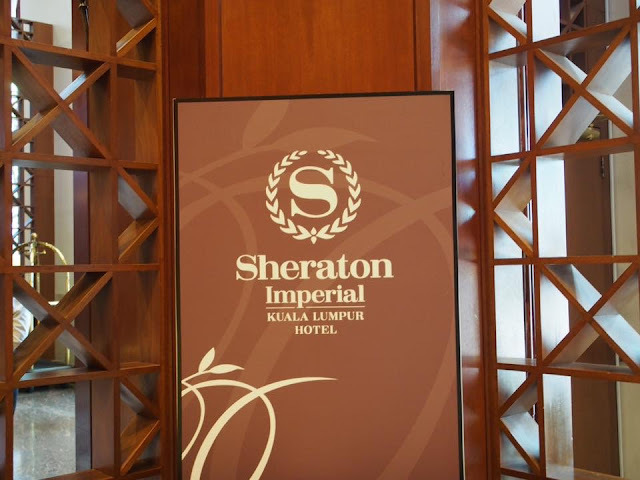 Sheraton Imperial Kuala Lumpur is a 5-star hotel located in the heart of KL is one of the best hotel around the city. You can stay here if you need to go to meetings nearby or want to visit nearby locations over the weekend or simply just planning your staycation. My stay has always been amazing whenever I stay in this hotel. It makes me feel at home. Great reception and services, clean and beautiful rooms, delicious food, relaxing pool and a nice gym facilities. My experience at Sheraton Imperial KL is superb, friendly staff, food excellent & room comfort is the best of all. Also I found the lighting of room very stylish & room spacious in deluxe rooms , it's very grand & has very elegant & royal touches especially frames of mirror & frames. I simply love it as I'm from Singapore & I felt like my home. The Sheraton Imperial Kuala Lumpur Hotel guest will have access to a full complement of personalized services and offerings. The many thoughtful conveniences include our elegantly appointed Sheraton Club Lounge and fully-equipped business center, a well-informed concierge team, limousine services, welcome fruit platters, and express check-outs. At the Sheraton Imperial Kuala Lumpur Hotel, you are never far from life's most important needs, all conveniently located within the hotel or just steps from our doors. Available services include an exclusive tailor, a sundry shop, a clinic, a florist, and a travel agent. Welcome to The Armoury Singapore located the Beach Road, the perfect place for brunching! I spent my 28th birthday last month with my colleagues here at Armoury for some early morning coffee and perfect brunch indulgence to satisfy our cravings for some Egg's Benedict, bacon and waffles. I have not tried going for brunch in a long time so this was a totally new food experience wherein we gotta wake up early and feed ourselves with some satisfying brunch menus with exotic culinary fusion where it's taste worked perfectly with our taste buds. THE ARMOURY is a contemporary cafe / bar with a modern-classical look that ties up with the history of its location at South Beach Quarter. Their brunch is available from 7:30AM to 3:30PM. Whether you want Espresso, Long Black, Latte or Mocha they have all the coffee varieties in here. Take a look at the items we ordered that you will definitely love as well.